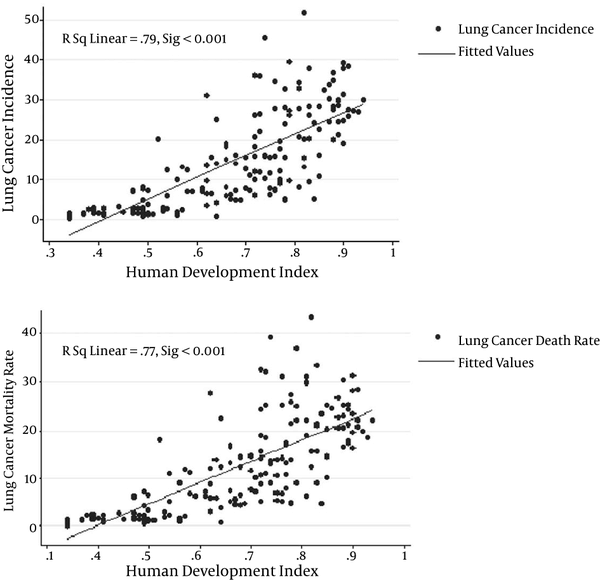 To Cite: Soheylizad M, Khazaei S, Khazaei S, Rezaeian S. Relation Between Lung Cancer Incidence and Mortality Rates with Human Development Index and Its Components: A Global Ecological Study, Int J Cancer Manag. 2016 ; 9(5):e5310. doi: 10.17795/ijcp-5310. This study aimed to identify the role of HDI in the incidence and mortality rates of lung cancer (LC) worldwide. Data about the incidence and mortality rate of LC for the year 2012 was obtained from the global cancer project for 172 countries. Data about the HDI and other indices were obtained for 169 countries from the United Nations development programme database. In 2012, LC was estimated to have affected a total of 1,824,701 individuals (crude rate: 25.9 per 100,000 individuals), and caused 1,589,925 deaths worldwide (crude rate: 22.5 per 100,000 individuals). LC accounts for 13% of total cancers incidence. There was a positive correlation between the HDI and LC incidence (R = 0.79, P < 0.05), and also with LC mortality rate (R = 0.77, P < 0.05) in the world in 2012. Linear regression model showed that increasing of HDI, mean of life expectancy at birth, mean years of schooling, GNI per capita, percent of urbanization, and age standardized obesity had a positive effect on increase in both incidence and mortality rates of LC. Our study showed that the burden of LC is enormous in high and very high HDI regions. Such actions include primary prevention strategies to effective control of the lifestyle behaviours prevalence including tobacco avoidance and cessation of smoking, a reduction in alcohol consumption and obesity, and the promotion of increased levels of physical activity, as well as the implementation of early detection programs. Moreover, further reductions in mortality could be brought about by increasing access to curative treatment for patients with LC. Cancer is already the leading cause of death in many high-income countries and is set to become a major cause of morbidity and mortality in the next decades in every region of the world (1). Lung cancer (LC) is the most common cancer worldwide, with the majority of the cases in developed countries (2) and the leading cause of cancer deaths among both men and women in high-income countries (3). LC estimated to have affected a total of 1,824,701 individuals, and caused 1,589,925 deaths worldwide, in 2012 (4). The incidence of LC is different in various regions. The mean incidence varied from 1.5 to 39.06 per 100,000 individuals (5). It is associated with heavy burdens on communities (6). Determining the risk factors associated with this high burden is crucial for prevention and control of cancer (7). Many factors have been reported as the risk of developing LC. Human Development index (HDI) is one of these factors known as an independent predictor. Studies have shown that HDI is associated with the incidence and distribution of cancer types (7-9). LC is the most common cancer in all communities with different HDI. In communities with high HDI, the incidence of LC is rising in women (2). It is necessary to find information on epidemiology and inequalities related to incidence and mortality of the cancer to use for planning and further researches. This study aimed to identify the role of HDI in the incidence and mortality rates of LC worldwide. This ecological study was performed on the relation of the age-specific incidence and mortality rate (ASR) of LC and HDI. HDI has several main components including life expectancy at birth, mean years of schooling, gross national income (GNI) per capita, some ancillary indexes including percent of urbanization, and age standardized obesity (defined as BMI > 30) in adults (The weighted average of the age-specific obesity rate among adults ages 20 and older). ASR is a summary measure of the rate that having a standard age structure, a population distribution would have. Since age has a powerful influence on the risk of cancer, standardization is necessary when comparing several populations that differ with respect to age. Data about the incidence and mortality rate of LC for the year 2012 was obtained from the global cancer project for 172 countries (10). Data about the HDI and other indices were obtained for 169 countries from the United Nations development programme (UNDP) database (11). Data analysis was restricted to 169 countries for which both the epidemiological data from the GLOBOCAN database and the HDI were available. These countries were categorized into four categories including (1) very high human development (27 countries), (2) high human development (37 countries), (3) medium human development (89 countries) and (4) low human development (16 countries). In this study, we used the correlation bivariate method for assessment of the correlation between the incidence and mortality rates of LC and the HDI. We also used linear regression models for assessment of the HDI effect on LC occurrence rates. The significance level of 0.05 was considered. Data were analyzed by Stata computer software version 12 (StataCorp, College Station, TX, USA). In 2012, LC was estimated to have affected a total of 1,824,701 individuals (crude rate: 25.9 per 100,000 individuals), and caused 1,589,925 deaths worldwide (crude rate: 22.5 per 100,000 individuals). LC was ranked as the most common cancer among both sexes by GLOBOCAN database, by 13% of total cancers incidences. The highest HDI values were those of privileged countries such as USA, Canada, Australia, and Western Europe (Figure 1). In addition, Figure 2 shows the estimated incidence of LC worldwide. Accordingly, LC incidence rate occurred most frequently in Europe and Latin American countries with the highest HDI. While the highest age-standardized incidence of LC was seen in very developed regions, also the highest age-standardized mortality of LC was of these regions. More specifically, in highly or very highly developed regions of the world, the highest value of LEB, MYS, GNI, and total HDI were estimated to be 80.2, 11.7, 40, and 0.89, respectively (Table 1). Abbreviations: LC, lung cancer; CR, crude Rate; ASR, age-standardized rates per 100,000; HDI, human development index; LEB, life expectancy at birth; MYS, mean years of schooling; GNI, gross national income per capita. According to Figure 3, there was a positive correlation between the HDI and LC incidence (R = 0.79, P < 0.05), also with LC mortality rate (R = 0.77, P < 0.05) in the world in 2012. Linear regression model showed that increasing of HDI had a positive effect on increase in both incidence (B = 54.8, P < 0.001) and mortality (B = 44.2, P < 0.001) rates of LC. The mean of life expectancy at birth, mean years of schooling, GNI per capita, percent of urbanization, and age standardized obesity had also a positive effect on increase in both incidence and mortality rates (Table 2). Our results showed that in 2012, 1,824,701 cases of LC have been identified worldwide that was associated with 1589925 deaths from this cancer. According to the results of this study, the highest incidence of LC has occurred, particularly in countries with high and very high HDI. So that an increase in this index, incidence and mortality rates of LC was significantly increased. This significant relationship was also true for each of the components of HDI. This finding was consistent with results of other studies that have examined the relationship between HDI and cancer (2, 12). The incidence of LC increases along with the development, so that the cancer incidence is more in undeveloped countries than less developed countries (13). Studies indicated that the burden of disease from LC is more in countries with high HDI than others (14). There are some effective factors for this finding. In developed countries less than developed countries, LC may be more detected and recorded because of high quality of health system, a suitable infrastructure for the diagnosis, and a population registration system, as well as lifestyle behaviours (8, 15). For as much as HDI composed of main components that include: life expectancy at birth, mean years of schooling, and GNI per capita, and the role of each of these components can be examined in this finding. People over 50 years of age are most susceptible to cancer (16), in countries where life expectancy is greater. The probability of survival to older age is more and the risk of cancer increases because cancer occurs in old age and its causal factors in the long-term exposures show their effects (17). On the other hand, with increasing the mean years of schooling in different countries the level of health literacy will also increase, which leads to enhanced awareness of LC screening and diagnostic programs and their participation in these programmes. In addition, the high level of GNI in these countries could help people to afford to participate in these programs. Accordingly, utilization of these facilities could lead to increased incidence and mortality rates of LC. In other studies, a negative relationship was reported between the level of education and LC (18, 19). According to the result of our study and other studies, HDI can be used as an independent predictor of LC (20). Studies have demonstrated that LC is seen more in higher social classes. In other words, the cancer is more common in the countries with high social level (21). In this study, the role of urbanization and age standardized obesity in adults as independent predictors of incidence and mortality rates of LC have reported. Due to the fact that with increasing urbanization, exposure to certain risk factors for LC, including air pollution (22) and smoking, (23) will increase,; therefore, this finding is not unexpected. The role of obesity as a risk factor in cancer has been shown in other studies (24) and is consistent with the findings of our study. One limitation of this study is that it impossible to generalize the results to small communities and individuals (ecologic fallacy). It is recommended that similar studies be done at the national level and smaller communities in different countries. It is also recommended that in future studies, other aspects related to LC to be surveyed. Our study showed that the burden of LC is enormous in high and very high HDI regions. Targeted interventions have the ability to reduce this number significantly through resource-dependent interventions. Such actions include primary prevention strategies to effectively control the prevalence of lifestyle behaviours including tobacco avoidance and cessation of smoking, a reduction in alcohol consumption and obesity, and the promotion of increased levels of physical activity, as well as the implementation of early detection programs. Moreover, further reductions in mortality could be brought about by increasing access to curative treatment for patients with LC. This paper used data from the GLOBOCAN and the United Nations development programme (UNDP). The authors declare that there is no conflict of interests to report for this work.